A major regional bank, Fifth Third Bank, entered a motion to appoint a Receiver to preserve the asset value of a partially completed townhouse development in the City of Chicago. The borrower/developer was out of compliance with his TIF Development Agreement and delinquent in paying debt service, contractors, utility companies and taxing authorities in excess of $3 million. The Property entered Receivership under the jurisdiction of the Mechanic’s Lien division of the Chancery Court for the purpose of: 1) completing the construction of the remaining units and common areas, 2) reinstating the TIF Development Agreement, 3) resolving matters with the HOA, and 4) completing the existing environmental remediation program. Renaissance Estates is a PUD Development consisting of 68-sold townhomes, 2-completed unsold townhomes, 6-partially completed townhomes, 1-SFH foundation, and land to construct an additional 7-townhomes. The PUD also includes common area amenities that are not yet built, including a tennis court, dog run, and play lot. The Receiver was appointed over the PUD except the 68-sold townhomes. There are four floor plan models that range in size from 1,345 sq. f t. to 1,920 sq. 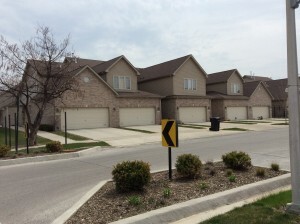 ft. Two of the townhomes are 95% completed and have Certificates of Occupancy. The remaining 6-unsold townhomes are in various stages of completion, from just the exterior shell to 75% completed. The single-family house construction stopped at the foundation. None of the common area amenities are built. The Receiver solicited bids from subcontractors to obtain costs to complete the unfinished townhomes. The cost to complete construction was an important component of the overall development plan that was needed for reinstatement of the TIF Agreement. The Receiver resumed the Illinois State and Federal application for Remedial Action Plan (RAP) approval and engaged an environmental consultant to complete the required documentation and perform the required tests. The RAP approval was received from the State of Illinois but the Federal approval process stopped just short of completion due to lack of funds. The Receiver entered a motion to compel the borrower/developer to provide all construction payment documentation and proof of compliance to TIF Development Agreement procedures. The Court approved the Motion and ordered the Defendant to provide the evidence requested by the Receiver.